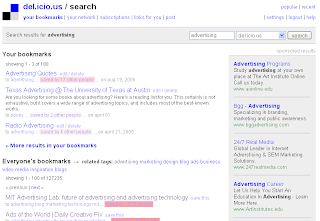 This looks fairly new: apparently, Yahoo has extended its text advertising program to its social bookmarking service Del.icio.us that it had acquired back in 2005. I wrote before that ads on social networking sites should acquire some of the social properties as well, like the gadget ads Google is currently testing, and many others. For del.icio.us, it would make sense to add "save this" button on each ad unit.